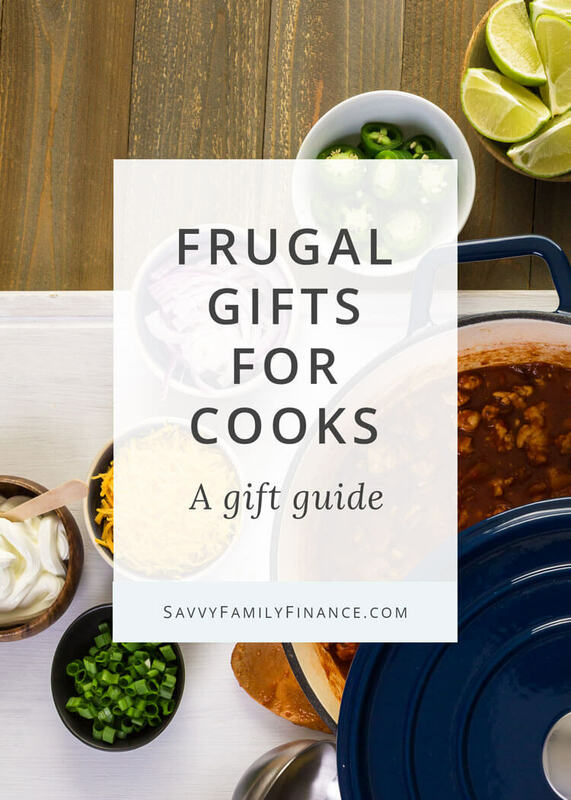 Inside: Frugal gift ideas for the cook in your life. If there is someone on your list that likes to cook, then chances are she would welcome upgraded and useful tools in the kitchen. Kitchen tools get used and abused on a daily basis. And, as a home chef cooks more, she figures out what works and what doesn’t as well as what would be nice to have. These are all great and yet frugal gifts for the home cook. A nice, solid mortar and pestle is handy to have around to crush or grind spices or make a paste. I bought myself a set of prep bowls on a whim and you know what? I love them. They get used all the time. The measurement markings are handy. And because the bowls nest, they only take up a small corner of my utensil drawer. When it comes to pastry or rolling out cookie dough, a good rolling pin is a must. This rolling pin is made in the USA and comes at a very reasonable price point. The thing I like best about it? It is a good amount wider than those rolling pins with handles, making it easier to get an even thickness. A nice yet functional apron is a must-have in the kitchen. Nobody wants to ruin their shirt with spatters. This apron comes in many different designs and the adjustable neckline ensures it will fit. These spoon rests are colorful and perfectly functional. I love how large they are and having a set means I always have one handy even if a couple are in the dishwasher. After hesitating for a few years getting a mat, I decided to put one on my own wish list. When I got it, it was put to the test. And..love it! So much so that I ordered a second for my other pan. These work and clean up beautifully without worrying about running out of parchment paper or having to scrub away at stuck on food for hours on end. These bowls are very handy. Whether it is mixing up a salad to take to a potluck, whipping up some batter, or storing leftovers, these bowls will get used. Dutch ovens are amazing to cook with. A good one conducts heat well and will retain heat for a long time. They are perfect for soups, stews and even roasts. They are also great for casseroles or that crusty bread you’ve been wanting to try. You can use kitchen shears for more than opening packages. They are great for cutting meat, herbs and even canned whole tomatoes (put blades in can and snip). The shears can also easily cut dried fruit, help you break down poultry. Having a food scale has been great for cooking. There are many recipes written in just weights or that may specify weights rather than measurements for some foods. Can you eyeball 1 pound of chicken or 2.5 lbs of diced potatoes? This takes the guesswork out of the measurements. The Instant Pot seems to be the must-have kitchen gadget. While it isn’t inexpensive, consider that it can take the place of a rice cooker, slow cooker and a pressure cooker. This is a great gift for the young person starting out or the busy home where everyone rushes home and tries to get dinner on the table quickly.